He happens to meet Kamisaka Haruhi, a school idol as well as the genius girl in magical course at the park, and she gives him a chocolate. 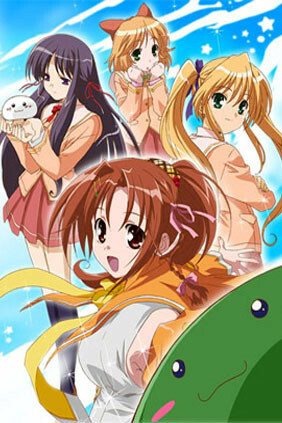 Then, because of the mysterious collapse of the school building of magical course, Haruhi transfers to the same class of Yuma, and his troublesome school days is getting worse. Hiiragi Anri - She has a feeling of competition against Haruhi, and she is called “Walking Disaster Slinkier”. Komine Koyuki - Her eccentric act always embarrasses or surprises others. Kohinata Sumomo - She is his sister-in-law. She is steady, but she is sometimes airhead. Furthermore, his bad friends Hach , Jun, and a mysterious transfer student acceralate his fate..
Happiness! centers around Yūma Kohinata, who is a high school student attending Mizuhosaka Academy's regular section of the school, along with his close friends Jun Watarase and Hachisuke Takamizo. The other section, aptly named the magic section, was founded in order to train mages in the art of using magic. The story begins with Valentine's Day coming up in just a few days and there's a rush for all the girls to get the chocolate they want in order to give it to the boys they like, in accordance with Japanese custom. Haruhi Kamisaka, a mage in training, is out with her friend Anri Hiiragi, also a mage in training, in order to do just this. While walking outside in the park, after buying the chocolate she wanted to give to a boy she met when she was a child, Haruhi meets Yūma, who stops some younger boys bullying a young girl, and Haruhi thinks that he may be the boy she's been searching for all this time. The next day is Valentine's Day and at school, all the girls are giving their gifts to the boys of their choice. Later that day, Anri challenges Haruhi to a magic battle in order to take the chocolate she has by force for the reason that Haruhi wouldn't tell her who she was going to give it to. Before long, Anri loses control of her magic and it is flown outside, almost falling onto Yūma and his friends. Ultimately, Haruhi gives him the chocolate she had bought, and in turn Anri does the same, which was her plan - to give her chocolate to the same boy as Haruhi and see who would win his favor more. The next day there is a gas explosion at the magic section of the school and all the mages in training must transfer over to the normal section for the time being. Coincidentally, Haruhi and Anri are placed within Yūma's class. Now Haruhi and her friends must adjust to the transfer into the normal section of Mizuhosaka Academy.